The case of the very rare jellyfish turns out to be just a case of mistaken identity. Karen Kienberger, of the Institute of Marine Sciences of Andalusia (CSIC), with the Rhizostoma luteum jellyfish. The jellyfish was first discovered in 1827 in the Strait of Gibraltar by French naturalists Jean René Constant Quoy and Joseph Paul Gaimard. At that time, as many as nine specimens were found. The species was named Rhizostoma luteum (formerly called the Orythialutea). 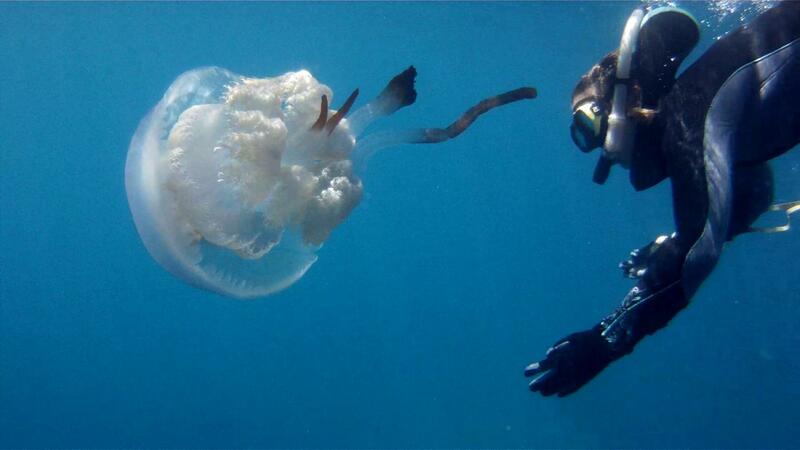 After that, no sightings were reported of the jellyfish until 2013. This was when a team of scientists used a phylogenetic analysis to confirm the presence of the jellyfish in the Mediterranean. Apparently, the species was not as rare as previously thought. Seems it was just a case of mistaken identity. "We believe that every time it was seen, it was mistakenly identified with such other jellyfish as the Rhizostoma pulmo, the Rhizostoma octopus and the Catostylus tagi," said Laura Prieto of the Institute of Marine Sciences of Andalusia (CSIC). The paper on the scientists' findings has been published in the Marine Biology journal. In the course of their research, the team received assistance from citizens who sent in historical accounts, photos and videos taken in the North-East Atlantic Ocean and the Alboran Sea. They also got in touch with many authors of the photos and explored open social networks and open-access databases on jellyfishes. The research yielded more than 150 observations in the last 17 years, thanks to the workings of citizen science. The R. luteum is frequent in the coastal waters of the western and southern coasts of the Iberian peninsula and the western and northern coasts of Africa.